Although Uncle Sam (initials U.S.) is the most popular personification of the United States, many Americans have little or no concept of his origins. If pressed, the average American might point to the early 20th century and Sam’s frequent appearance on army recruitment posters. In reality, however, the figure of Uncle Sam dates back much further. Portraying the tradition of representative male icons in America, which can be traced well back into colonial times, the actual figure of Uncle Sam, dates from the War of 1812. At that point, most American icons had been geographically specific, centering most often on the New England area. However, the War of 1812 sparked a renewed interest in national identity which had faded since the American Revolution. During the War of 1812, the demand for meat supply for the troops was badly needed. Secretary of War, William Eustis, made a contract with Elbert Anderson, Jr. of New York City to supply and issue all rations necessary for the United States forces in New York and New Jersey for one year. Anderson ran an advertisement on October 6, 1813 looking to fill the contract. The Wilson brothers bid for the contract and won. The contract was to fill 2,000 barrels of pork and 3,000 barrels of beef for one year. Situated on the Hudson River, their location made it ideal to receive the animals and to ship the product. A number of soldiers who were originally from Troy, also saw the designation on the barrels, and being acquainted with Sam Wilson and his nickname “Uncle Sam”, and the knowledge that Wilson was feeding the army, led them to the same conclusion. The local newspaper soon picked up on the story and Uncle Sam eventually gained widespread acceptance as the nickname for the U.S. federal government. Though this is an endearing local story, there is doubt as to whether it is the actual source of the term. Uncle Sam is mentioned previous to the War of 1812 in the popular song “Yankee Doodle”, which appeared in 1775. However, it is not clear whether this reference is to Uncle Sam as a metaphor for the United States, or to an actual person named Sam. Another early reference to the term appeared in 1819, predating Wilson’s contract with the government. The connection between this local saying and the national legend is not easily traced. As early as 1830, there were inquiries into the origin of the term “Uncle Sam”. The connection between the popular cartoon figure and Samuel Wilson was reported in the New York Gazette on May 12, 1830. Regardless of the actual source, Uncle Sam immediately became popular as a symbol of an ever-changing nation. His “likeness” appeared in drawings in various forms including resemblances to Brother Jonathan, a national personification and emblem of New England, and Abraham Lincoln, and others. In the late 1860s and 1870s, political cartoonist Thomas Nast began popularizing the image of Uncle Sam. Nast continued to evolve the image, eventually giving Sam the white beard and stars-and-stripes suit that are associated with the character today. He is also credited with creating the modern image of Santa Claus as well as coming up with the donkey as a symbol for the Democratic Party and the elephant as a symbol for the Republicans. However, when a military recruiting poster was created in about 1917, the image of Uncle Sam was firmly set into American consciousness. 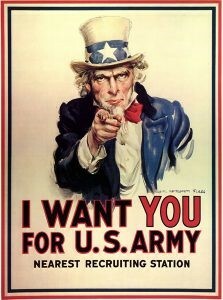 The famous “I Want You” recruiting poster was created by James Montgomery Flagg and four million posters were printed between 1917 and 1918. Indeed, the image was a powerful one: Uncle Sam’s striking features, expressive eyebrows, pointed finger, and direct address to the viewer made this drawing into an American icon. Uncle Sam represents a manifestation of patriotic emotion. Kathy started LegendsOfAmerica.com in 2003 as a way to share her passion for American history and travel destinations across our great nation. She is a published author and has had several appearances on television talking about different old west characters. Kathy and her husband Dave run the website from their home on the Lake of the Ozarks just outside Warsaw, Missouri.